Ok, I can’t go on much longer talking about Kagawa, the Seto islands, and of course Naoshima without talking about the Benesse House! So here is, finally, my first post on the topic. As you know if you’re a long time reader of this blog (well, it’s not that old, so I don’t know is “long time” applies, but you see what I mean) I have a love/hate relationship with contemporary art. I love it when it was social and human dimension and value. I like it much less when it’s a little too conceptual and when it is a manifestation of some random ideas that the artist had one fine day and decided to call it art. Also, I’d rather – by far – experience art when it is in the real world, especially if it’s integrated in its environment than seeing it enclosed and locked in a museum. 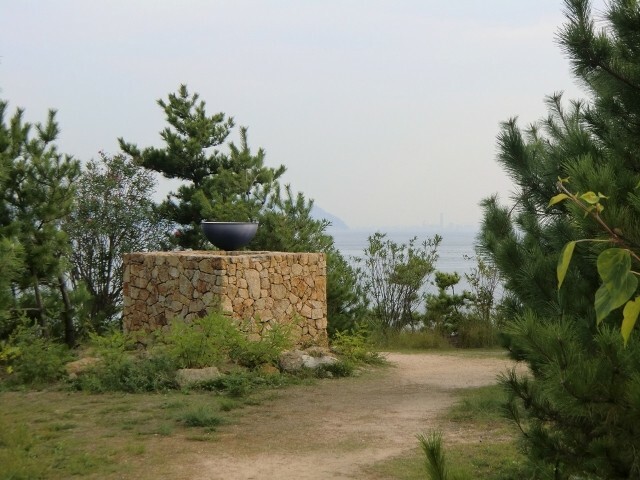 For these reasons, I must admit that I was a bit apprehensive before visiting the Benesse House Museum, and I had indeed mixed feelings after the visit. But before going any further, maybe I need to explain what the Benesse House is for those of you who don’t know. So, in Japan, there is this company, the Benesse Corporation, a big publishing company for textbooks and other educational materials. It was founded in 1955 in Okayama under the name Fukutake Publishing Co. Ltd. (株式会社福武書店 – Kabushiki-gaisha Fukutake Shoten). As years went by, it grew and diversified, opening several evening and language schools on top of its publishing activities. It was renamed Benesse Corporation in 1995 (Benesse coming from Latin ben esse which means well-being). It has never stopped growing to the point that it is a pretty big company nowadays in Japan. And while it is relatively unknown outside of Japan, you may know the Berlitz company that has been acquired by the Benesse Corporation in 2001. 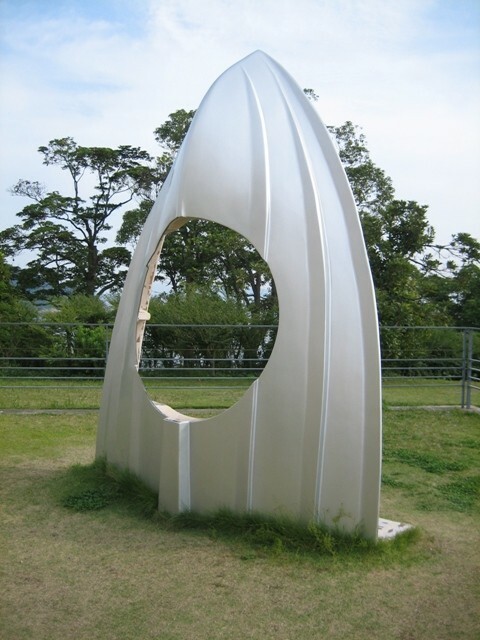 And it is thanks to the Benesse Corporation and the Fukutake family that Naoshima has become this world-renowned center for contemporary art and that the Setouchi International Art Festival came to exist. It’s a rare enough thing that large corporations get involve in such endeavors that don’t bring profit and are almost humanitarian in nature. So it deserves to be underlined. 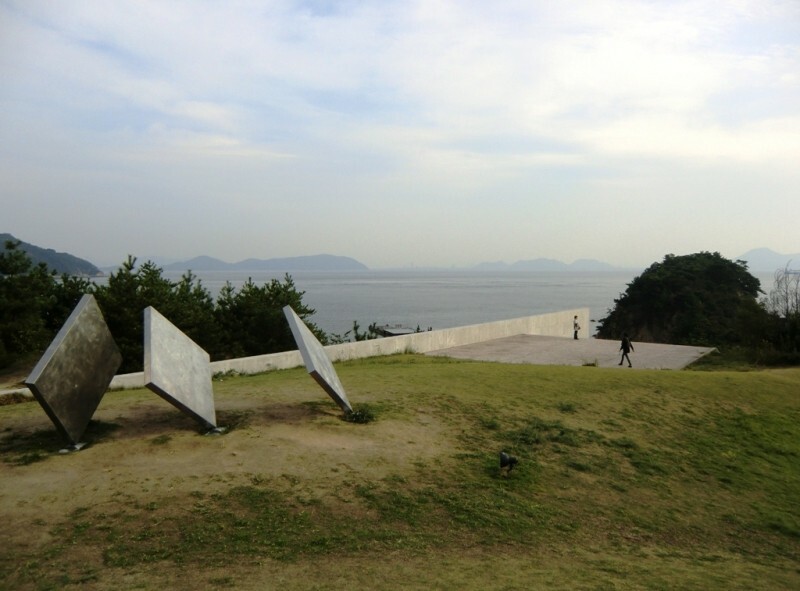 A “piece” of Naoshima, seen from the Benesse House Museum. 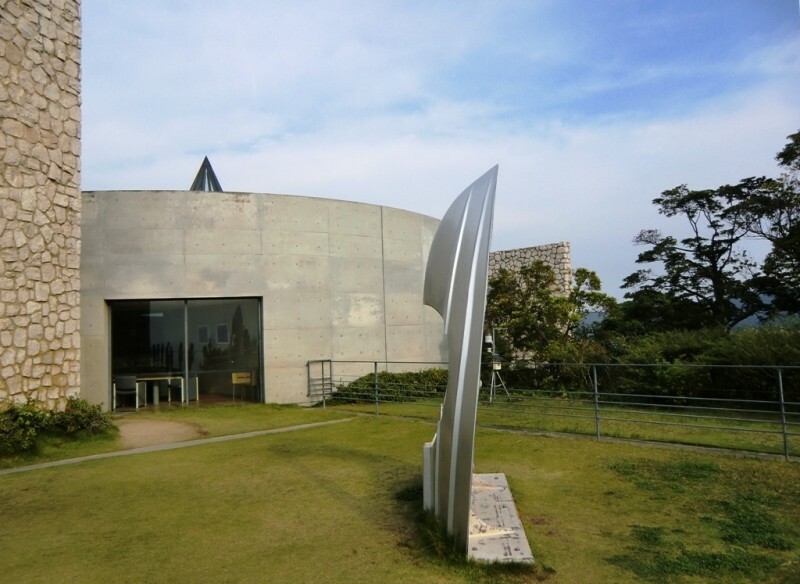 The beginnings of Benesse Art Site Naoshima date back to the 1980’s. 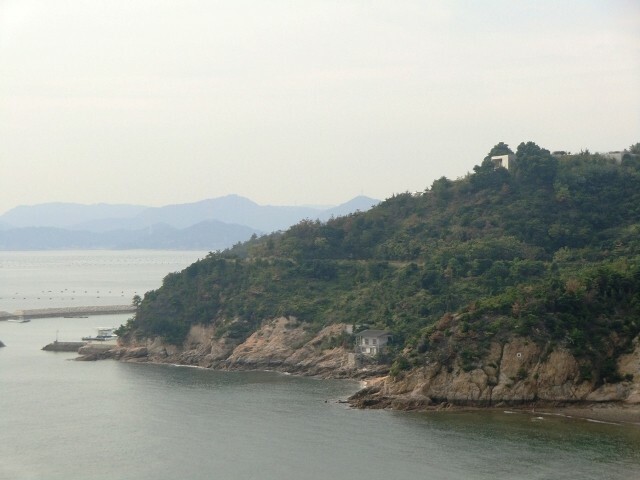 At that time, Tetsuhiko Fukutake, founder of Fukutake Publishing Co. Ltd, dreamed about creating on a Seto Inland Sea island a place where children from all around the world could get together. 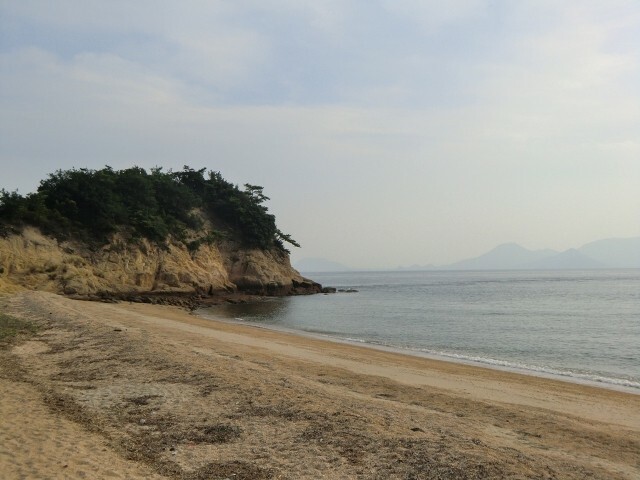 Meanwhile, Chikatsugu Miyake, then Naoshima’s Mayor, wanted to develop the southern part of the island, possibly creating a place for education and culture. They quickly agreed to work together on a project that would bring together their ideas. Soon after they founded a summer camp for children of the company’s employees. 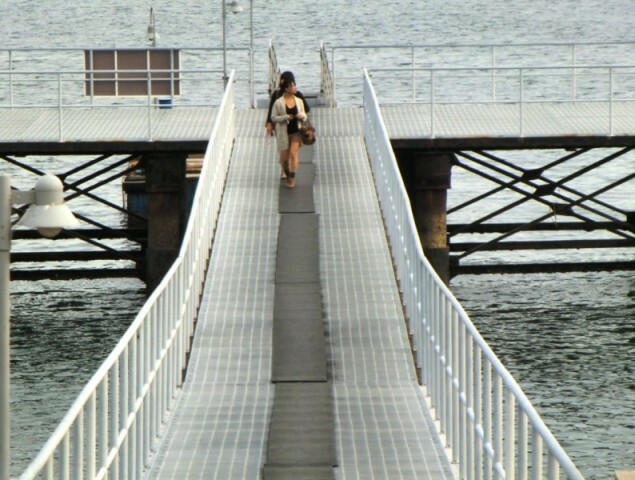 In 1989, the Naoshima International Camp opened. 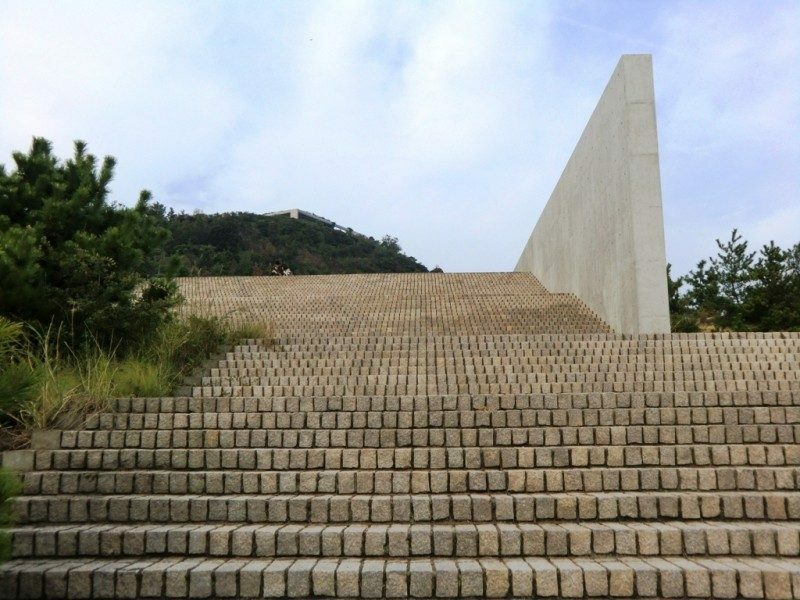 It was designed under architect Tadao Andō‘s supervision. And in case you don’t know it already, since that day his name has become inseparable from Naoshima. 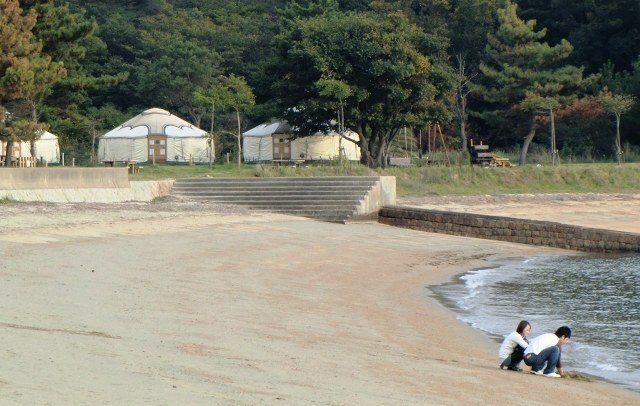 The campground still exists today – although anyone can go, not just Benesse employees’ children – and it has the particularity to have Mongolian Yurts. 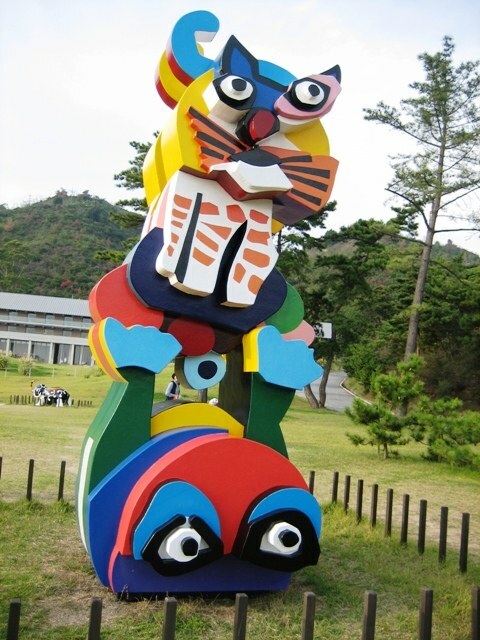 One year later, Karel Appel‘s Frog and Cat was the first piece of art installed on the site. 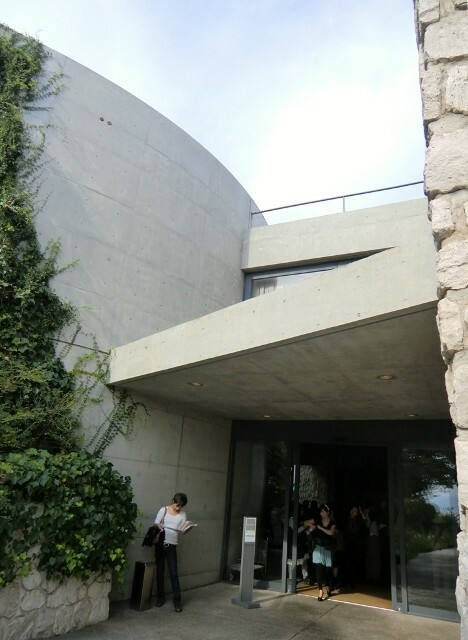 Around the same time, construction of Tadao Andō‘s most famous work on Naoshima, that is the Benesse House Museumwhich opened its doors in 1992. Ever since that day, visitors are coming more and more numerous each year to the point that it is today one of the main tourist destinations in the area and it has proven to be a fundamental key in revitalizing the island that prior to it only survived because of a copper refining factory on the north coast of the island (that is opposite to the Benesse House, and actually today very few visitors know that there is such an industry on the island). I now will leave history aside (until my next post on this topic) to tell you a little bit about the Museum and then shut up and just show you pictures of the area. Pictures from inside the Benesse House Museum you won’t see, as it is forbidden to take any, and while many people didn’t care and still took pictures (including Japanese people to my surprise) I didn’t because I’m like that. It was possible to take pictures on the terrace. However, I have no idea of this artwork’s name. What can be said about the Museum itself? The building is really amazing, regardless of whether your a fan of Andō‘s works or not. I mean, concrete is not usually a material I get excited about, but I surprised myself being amazed at his creations. As far as the artworks inside, I won’t detail them (especially because it’d be quite pointless without pictures), I’ll simply say that as in pretty much any contemporary art museum it went from quite good to pretty bad. On the other hand, what I really like there are all the sculptures that can be found outside, all around the Museum. They give to the whole area a very unique atmosphere and feeling that is impossible to not love. Ok, time to stop blabbering and to show you what I’m talking about. Those metal plates slowly move pushed by the wind. Such valuable info. Thank you!